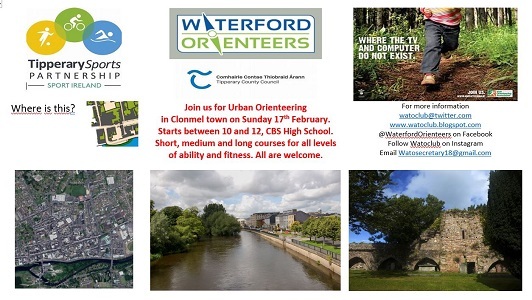 Join us for the Urban Orienteering in Clonmel town on Sunday 17th February. Starts between 10 and 12, CBS High School. Short, medium and long courses for all levels of ability and fitness. All are welcome. Waterford Orienteering Club is based in Waterford but they run events throughout the Southeast. The start times for the event are from 10 to 12 from the CBS High school. The short course for under 15’s and beginners will not cross and road. The medium (5km) and long (7.5 km) courses will be more technical and cover the area as far as the river bewteen the 2 bridges. This is the 4th of a series of urban orienteering events. The others were in Carlow (2) and Dunmore East. Hosted with Waterford Orienteering Club and Tipperary Sports Partnership with CBS High School. Standard entry fees (to cover cost of maps and rental of electronic timing system) are €7 for adults, €5 for OAPs and students, €4 for juniors and €3 for uniformed groups. The family rate is €20 with a reduction for first timers. Under 15’s have to be accompanied by an adult on medium or long courses for safety reasons.